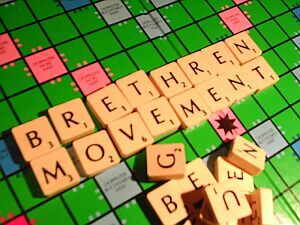 The Brethren Movement is one of the largest free-church movements in Germany (total membership: c. 40,000). However, as it is divided into several subgroups, some of them doing no public relations work at all, it doesn’t play a very conspicuous role in the German church scene. This website, founded in October 2003, is a private initiative trying to show the specific aims of the Brethren Movement and the roots of its various subgroups. It provides information about the movement’s historical development as well as about its present-day situation, taking into account all relevant groups. Most of the site is in German, but there are a number of English documents as well. They are listed below. You will also find many English entries on our international links and biography pages. Please note that this website is a neutral resource of information and not an official site of any German Brethren group. If you want to respond to our site, please write us an e-mail message. Anthony Norris Groves: Letter to John Nelson Darby (1836). Groves’ famous “prophetic letter” warning about sectarian tendencies within the Brethren Movement [6 pages, 64 KB].  A Portuguese translation is also available: Carta para John Nelson Darby [4 pages, 54 KB]. Anonymous: A Descent amongst the Dissenters. Bethesda (Craik and Müller) Chapel, Great George Street (from: Bristol Times, 1848). Newspaper report about George Müller’s orphan work and about Bethesda Chapel, Bristol [8 pages, 111 KB]. Henry Craik, Georg Müller et al. : The “Letter of the Ten” (1848). The first statement of the principles of “Open Brethren”, issued by the leaders of Bethesda Chapel, Bristol [6 pages, 48 KB]. Anonymous: A Retrospect of Events that have taken Place amongst the Brethren (with Appendix, 1849). Contemporary report and comment on the splits at Plymouth (1845) and Bristol (1848), written by a well-informed outsider. In an appendix, excerpts from important documents are compiled [42 pages, 302 KB]. Francis William Newman: Strivings after a more Primitive Christianity (from: Phases of Faith, 1850). Newman sympathized with the early Brethren Movement and assisted Anthony Norris Groves with his missionary work in Baghdad, but later turned away from Christianity. In the second chapter of his religious autobiography Phases of Faith he describes the influence John Nelson Darby (“the Irish clergyman”) had on him [13 pages, 122 KB]. John Nelson Darby: Early Beginnings (1853; from: The Christian’s Library, 1901). Notes of a report on the beginnings of the Brethren Movement in France, Switzerland and Germany, given by Darby on 24 November 1853 [8 pages, 182 KB]. Henry Morley: Brother Müller and his Orphan-Work (from: Household Words, 1857). This report, published in a widely-read journal edited by Charles Dickens, contributed substantially to the general recognition of George Müller's orphanage work. Contrary to popular belief, the author was not Dickens himself, but his collaborator Henry Morley (18221894), later professor of English literature [9 pages, 95 KB]. John Hall: The “Christian Brethren“ (from: The Evangelical Witness, and Presbyterian Review, 1863). Criticism of the Brethren Movement in an Irish Reformed chuch magazine (on the author, see Wikipedia). With a corrective and a supportive letter to the editor [9 pages, 106 KB]. Richard Morris: Rev. Henry Craik, Bristol (from: The Baptist Magazine, 1866). Obituary for Henry Craik (18051866), George Müller’s co-worker at Bethesda Chapel (Bristol). The author (18131894) was a Baptist pastor at Clifton [9 pages, 95 KB]. Early Open Brethren in the German-Speaking Countries. Excerpts from The Missionary Echo and Echoes of Service (18721918). These reports, hitherto overlooked by German Brethren historiography, are a first-rate source for the beginnings of Open Brethren in Germany, German-speaking Switzerland and Austria-Hungary [187 pages, 1406 KB]. “Criticus”: The Churches and Chapels of Nottingham: Their Ministers and Congregations. Amongst the Plymouth Brethren (from: The Nottingham & Midlands Counties Daily Express, 1878). A journalist’s report of a visit to the “Exclusive Brethren” assembly in Nottingham, Great Alfred Street [7 pages, 77 KB]. Henry Groves: Darbyism: Its Rise, Progress, and Development (third edition, c. 1880). The history of the “Exclusive Brethren” from 1845 to 1867, extensively commented from an “Open” point of view [65 pages, 528 KB]. John Gifford Bellett et al. : Interesting Reminiscences of the Early History of “Brethren” (n.d.). Bellett’s recollections of the beginnings of the Brethren Movement with supplements by John Nelson Darby, George Vicesimus Wigram, Edward Cronin and James Butler Stoney as well as Bellett’s last letter to Darby [12 pages, 114 KB]. George Thomas Stokes: John Nelson Darby (from: The Contemporary Review, 1885). Not so much a biography of Darby as an analysis of the church-historical situation at the time of the early Brethren Movement. This often-cited article by an Irish church historian is here made conveniently available online for the first time [14 pages, 130 KB]. Charles Brewer: Early Days in Herefordshire (from: Church Principles and Christian Practice, 1898). Memories of the beginnings of the Brethren Movement in the Hereford area. Important source for all later accounts [9 pages, 92 KB]. William Collingwood: The “Brethren”: A Historical Sketch (1899). A brief survey of the history and principles of the Brethren from an “Open” point of view [12 pages, 98 KB]. William Blair Neatby: Mr. William Kelly as a Theologian (from: The Expositor, 1907). A short introduction to the theology of William Kelly (ecclesiology, eschatology, christology, soteriology) and thus to essential doctrines of the “Brethren” in general [11 pages, 108 KB]. “Ecclesiasticus” (= Alexander Gammie): Byeways of Religious Life in Aberdeen. Among the Plymouth Brethren (from: Aberdeen Daily Journal, 1908). A journalist’s report of a visit to the “Open Brethren” assembly in Aberdeen, St Paul Street [5 pages, 50 KB]. Edward Elihu Whitfield: Plymouth Brethren (from: The New Schaff-Herzog Encyclopedia of Religious Knowledge, 1911). A fairly objective account of the history and teachings of the Brethren. The author was a member of the Stuart Brethren [8 pages, 82 KB]. Anonymous: The Wanderer at Church. The Foresters’ Hall (from: The Thanet Advertiser, 1915). A journalist’s report of a visit to the Brethren assembly at Foresters’ Hall, Ramsgate, Kent (probably a “Kelly” meeting since the hymn book mentioned, Good Tidings, was issued by the Kelly publishers Race and Hammond) [6 pages, 79 KB]. George Henry Lang: Observations upon The Union of Freechurch Christians in Germany (1938). Criticism by an English “Open Brother” of the organization formed by the German Brethren in 1937. Typescript, previously unpublished [20 pages, 154 KB]. Peter L. Embley: The Origins and Early Development of the Plymouth Brethren (1966/67). A thorough Ph.D. thesis dealing with the first 20 years of the movement [149 pages, 1111 KB]. Peter L. Embley: The Early Development of the Plymouth Brethren (from: Patterns of Sectarianism, 1967). A condensed version of the aforementioned Ph.D. thesis [21 pages, 206 KB]. Arthur Carl Piepkorn: Plymouth Brethren (Christian Brethren) (from: Concordia Theological Monthly, 1970). An objective survey of the various Brethren groups in the United States [9 pages, 79 KB]. Peter Brock: The Peace Testimony of the Early Plymouth Brethren (from: Church History, 1984). An examination of the pacifist views of some early Brethren, particularly Anthony Norris Groves, Georg Müller, John Nelson Darby, Benjamin Wills Newton, Percy Francis Hall and Charles Brenton [15 pages, 160 KB]. Peter J. Lineham: The Significance of J.G. Deck 18071884 (from: Christian Brethren Research Fellowship Journal [New Zealand], 1986). A pioneering article on the life of James George Deck, hymn-writer and father of the Brethren Movement in New Zealand [24 pages, 190 KB]. Max S. Weremchuk: You Ran Well ... Who Has Stopped You? (1989, revised 1996). A critical analysis of the situation among the “Reunited” (Kelly-Lowe-Continental-Glanton) assemblies, written by an insider [28 pages, 204 KB]. Max S. Weremchuk: Can We Recover the Brethren Legacy? (1998). An appeal to the “Reunited” (KLCG) Brethren to develop a positive attitude towards variety and to learn from other Christian groups [16 pages, 109 KB]. Lake Geneva Conference Report (1999). The proceedings of a “Reunited” (KLCG) conference in the United States trying to ascertain the principles of gathering from Scripture itself without referring to Brethren writings [60 pages, 258 KB]. Philip Nunn: Observations and Reflections of a Concerned Missionary (2002). Thoughts about current trends among the “Reunited” (KLCG) Brethren. The author was working as a missionary in Armenia, Colombia [22 pages, 147 KB]. Philip Nunn: The Re-dividing of the Reunited Brethren (2003). An analysis of the causes of the current process of disintegration among the “Reunited” (KLCG) Brethren [52 pages, 332 KB]. Max S. Weremchuk: John Nelson Darby Research Papers (20032007). In the 2000s Max Weremchuk worked on a revision of his Darby biography (1992) and published his new findings serially at the MyBrethren website before he decided to abandon the project. As that website was closed in November 2017, the material is reissued here (in a slightly edited form) [45 pages, 345 KB]. Max S. Weremchuk: John Nelson Darby. Chapter One, Revised Version (2018). New edition of the first chapter (“Beginnings”) of Weremchuk’s Darby biography (1992) with numerous recent insights and discoveries about Darby’s family background (including some hitherto unknown pictures). The appendix contains (inter alia) a letter from Darby’s father to his later brother-in-law Charles Vaughan (1783) and a letter from John Nelson Darby to his brother William Henry (1823) [48 pages, 2801 KB].